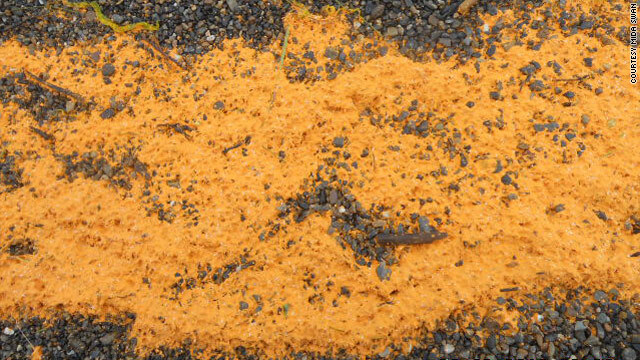 This orange substance mystified residents of Kivalina, Alaska, when it appeared on their shore Wednesday. A mysterious orange substance that washed up on the shores of an Alaskan village last week was a mass of microscopic, invertebrate eggs, possibly those of a small crustacean, a National Oceanic and Atmospheric Administration lab said Monday. More testing will determine the species and whether the eggs - whose appearance on the shores of Kivalina in northwest Alaska startled residents Wednesday - are toxic, said Julie Speegle, representative of the NOAA Alaska Fisheries Science Center's Auke Bay Laboratories. Residents of Kivalina, an Inupiat Eskimo village of about 430 people, found the substance in its lagoon - giving the lagoon an orange sheen - and clumps of the orange stuff on the beach. A resident who took pictures of the substance, Mida Swan, said last week that it had an oily feel, like baby oil. 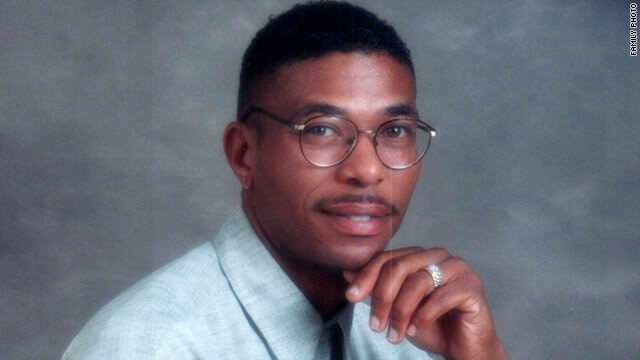 James Craig Anderson's killing was caught on video. Eighteen-year-old Deryl Dedmon was charged with murder Monday in the death of James Craig Anderson, a 49-year-old auto plant worker. Anderson was standing in a parking lot near his car when he was attacked by a group of teens yelling racial epithets, according to witnesses. Surveillance film acquired exclusively by CNN shows Anderson clearly in the headlights of a truck that then ran him over. Witnesses say Dedmon later took credit for the crime. Many CNN.com readers blamed the parents for raising their children to hate. bgirl38 said, "Thank god for surveilance cameras. These kids can only get that level of hate from their parents. There is no way a kid today can hate someone based on race, it starts at home. RIP Mr. Anderson!" GizzyN said, "Reading some of the racist, bigoted comments posted here, I don't know why any of us are surprised that horrible things like this still happen. It makes me sick to my stomach to see such disgusting comments being made by (supposed) adults in this day and age." [Updated at 4:16 p.m.] The Dow Jones Industrial Average has suffered its worst one-day loss since December 2008, plummeting 634.76 points - to 10,809.85 - after S&P downgraded its rating for U.S. credit. Monday's preliminary figure, after trading ending at 4 p.m. ET, represents a one-day loss of 5.5%. The Dow is below 11,000 for the first time since November. 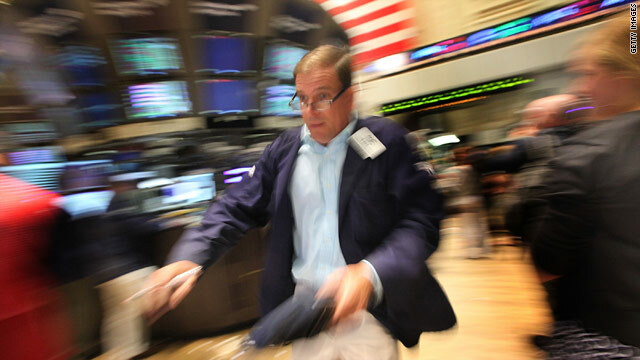 The S&P 500 fell 6.6% and Nasdaq Composite was down around 6.9%. [Updated at 2:27 p.m.] Dow extends loss to 600 points as stock sell-off accelerates. [Updated at 2:03 p.m.] Dow drops 450 points, falling below 11,000 for first time since last November, as sell-off extends. [Updated at 1:57 p.m.] President Barack Obama said Monday that the downgrade of the U.S. credit rating by Standard & Poor's occurred because "they doubted our political system's ability to act." [Updated at 10:33 a.m.] Stocks extend losses after Mortgage finance agencies Freddie Mac and Fannie Mae were downgraded by S&P, following downgrade of the United States. Dow falls more than 300 points. [Updated at 10:09 a.m.] U.S. stocks plunged Monday as Wall Street had its first opportunity to react to Standard & Poor's downgrade of U.S. debt. 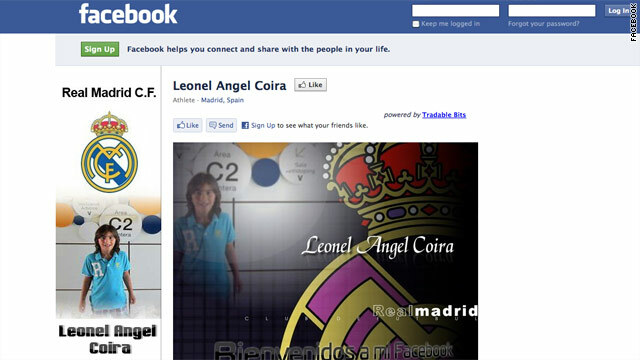 Leonel Angel Coira has reportedly signed a contract to join the Real Madrid youth system ... at age 7. Spanish soccer powerhouse Real Madrid has made what is sure to be one of the most talked-about moves of the off-season, signing a 7-year-old Argentine to its youth system, according to an Argentine sports website. The Spanish-language Ole ran an interview with Leonel Angel Coira in which the youngster said he had signed a contract to play in the Galacticos' youngest division. Real Madrid had no word of the signing on its website, but goal.com reported that club spokesman Juan Tapiador confirmed the news Monday. According to goal.com, Real Madrid snapped up the youngster to ward off attempts by other European clubs in the future - namely rival Atletico Madrid, which Ole said had already expressed interest in Coira. Coira told Ole last week that he preferred making assists over scoring goals, that he can juggle a ball eight or nine times without dropping it and that his dream is to play for Real Madrid's first team, which is home to some of the world's greatest players, including Kaka and Cristiano Ronaldo. His training with the under-9 players - or Benjamins, as they're known - begins September 6, he added. The team's Benjamin A squad is composed of 10-year-olds and one 11-year-old. Your take: Where do you stand on S&P downgrade? [Updated at 1:41 p.m.] The inability of Congress and President Barack Obama to reach a deal to raise the debt ceiling sparked a firestorm of anger directed toward Washington. Readers said they were angry, disappointed and fed up. They had no problem about where to point the finger when it came to blame. Quite frankly there was downright outrage. And now Standard & Poor's has downgraded the U.S. credit rating by one notch to AA+, removing it from the Triple A-club for the first time in history. As the market reacts to the downgrade status, CNN.com wants to know how people feel about it. Grab a video camera and sound off on iReport here. Some iReport contributors are already speaking out about the downgrade, whom it affects and how much the American public understands and cares about the issue. 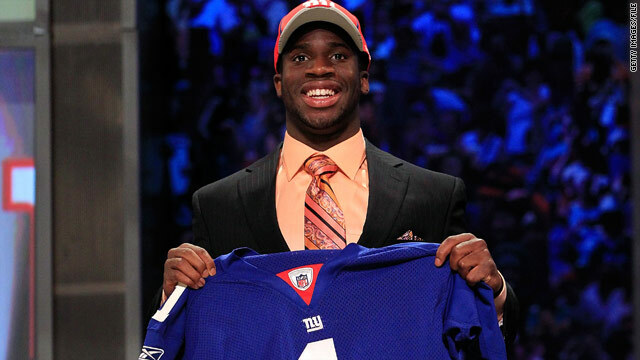 The Giants first-round draft pick Prince Amukamara has a broken left foot. "The first half is favorable, as six of the Giants' first seven opponents finished no better than two games under .500 last season," Gagne writes. "The lone exception is a Week 3 trip to Philadelphia, where Big Blue will try to snap a six-game losing streak against the reloaded Eagles. Soon enough, they'll truly have their work cut out for them. "The final nine weeks include road games against the Patriots, Saints, Cowboys and Jets (though there's no traveling for that last one, to be played at New Meadowlands Stadium on Christmas Eve). They'll also face the Eagles and Cowboys again, this time at home, and host the defending Super Bowl champion Packers. The Giants faded down the stretch and missed the playoffs the past two seasons, even after posting 10 wins last year. It's a realistic number to see in the win column, but once again, it may not be enough to put the Giants in the postseason." Boston Red Sox vs. Minnesota Twins (7:10 p.m., ET) - Kicking off a three-day road series against the Twins tonight, the Red Sox will look to continue the momentum from a dominant performance against the Yankees. The team took two of three games in that series. Aung San Suu Kyi, center, attends a religious ceremony Monday on the 23rd anniversary of the student uprising in Yangon. Nobel peace laureate Aung San Suu Kyi is tireless in her efforts to bring democracy to her homeland, and on Monday she continued to poke the tiger that is Myanmar's ruling military junta. The pro-democracy icon led hundreds in a demonstration at a Yangon monastery to commemorate the anniversary of the 1988 uprising that first put Suu Kyi at the forefront of the opposition's call for democratic change, according to The Irrawaddy news magazine. Several news outlets reported that authorities kept a close eye on the demonstrations but did not harass protesters despite the government's repeated warning to Suu Kyi that she should refrain from political activities. Voice of America reported that Suu Kyi will make a trip to Bago, about 50 miles northeast of Yangon, this weekend to attend the opening of two libraries and to meet with political network groups. President Barack Obama will make a statement to reporters Monday about the downgrade of the U.S. credit rating and the loss of U.S. service members, including 22 Navy SEALs, killed in Afghanistan over the weekend, a White House official said. The comments are scheduled for 1 p.m. ET at the White House. According to the White House official, Obama will offer a reassuring assessment of the economic situation, citing reasons for confidence in the U.S. economy despite the decision last week by Standard & Poor's to downgrade the U.S. credit rating for the first time in history. In addition, Obama will call again on the special congressional fiscal committee to be set up under the recent debt ceiling deal to take a "balanced" approach to deficit reduction that he has been advocating, the official said. 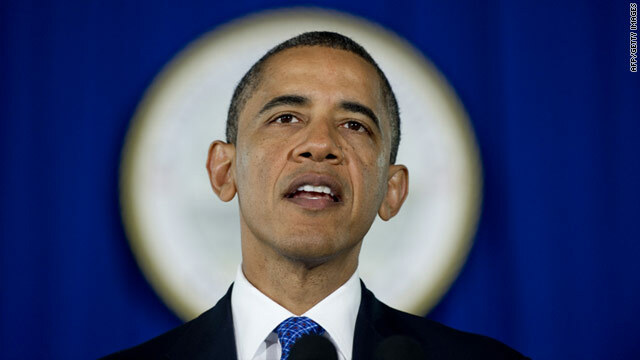 Obama has called for a comprehensive agreement that would cut spending, reform entitlement programs and increase tax revenue. Republicans oppose any kind of tax increase, and many reject increased tax revenue even if the tax rates remain the same or are lowered. As activists reported intense gunfire, mounting deaths and mass detentions Monday in Syria, regional leaders stepped up their criticism of the escalating violence. Saudi Arabia, Kuwait and Bahrain said they were recalling their ambassadors from Syria to discuss the situation. Officials announced the diplomatic moves after Saudi Arabia's King Abdullah condemned violence in Syria in a rare rebuke directed at a fellow Arab leader. "There is no justification for the bloodshed in Syria, and what is happening has nothing to do with religion or ethics," he said in remarks broadcast on state television early Monday. "The Syrian leadership could activate comprehensive reforms quickly." Activists inside and outside Syria said a government crackdown was continuing Monday. At least 65 people died during a military operation that began Sunday in Deir Ezzor, according to the activist network Local Coordination Committees of Syria (LCC). Tanks entered the town of Maaret al-Numan after more than a month stationed outside its borders, the LCC and the Syrian Observatory for Human Rights reported. Syrian forces reportedly detained dozens of residents there. Syrian state television reported that the military began pulling out of Hama Monday after accomplishing "the mission of protecting citizens." Coalition forces embroiled in a firefight with insurgents in eastern Afghanistan on Saturday had called for assistance, but instead had to race to the crash scene of a downed NATO helicopter carrying their reinforcements, officials said Monday. Everyone inside the CH-47 Chinook was killed, marking the worst single-day loss of American life since the beginning of the Afghan war, NATO reported. The inbound helicopter - loaded with 30 U.S. service members, a civilian interpreter and seven Afghan troops - crashed after being "reportedly fired on by an insurgent rocket-propelled grenade," the statement said. Twenty-five of those on board were U.S. special operations forces, including 22 Navy SEALs. Five air crew members were also on board. Until Monday, military officials had been largely tight-lipped about the circumstances surrounding the crash, which occurred in the rugged Tangi Valley area of Wardak province, about 60 miles southwest of Kabul. U.S. President Barack Obama is also expected to make a statement to reporters Monday that will include comments about the loss of the 30 U.S. service members, a White House official said. The events leading up to the crash began when insurgents - armed with rocket-propelled grenade launchers and AK-47 assault rifles - engaged in small arms fire with coalition forces on the ground, NATO reported. ISAF forces were carrying out an operation targeting a known Taliban leader in the area. 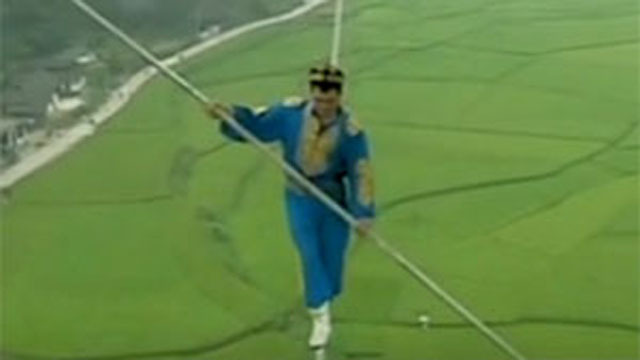 A Chinese man attempts to cross a high-wire suspended between two hot air balloons. It’s a thin line between life and death in these daring stunts. Maybe it’s the adrenaline that motivates these daredevils, or perhaps it’s just a goal they must conquer. A Chinese man was the latest to join the high-flying league on Saturday. You’ve gotta watch these stuntmen teeter sky high on their tiny tightropes across buildings, hot air balloons and the twin towers. The United Nations says almost half the Somali children arriving at Dadaab refugee complex are malnourished. Many die en route. Jill Biden, Vice President Joe Biden's wife, is in Kenya with former Republican Sen. Bill Frist and other dignitaries to emphasize the U.S. government's commitment to tackling the famine that has left more than 12 million East Africans in need of food. During her trip, Biden will visit the Dadaab refugee complex, a camp that receives more than 1,000 Somalis a day and is home to more than 400,000 displaced people. The camp is designed to accommodate about 90,000 refugees. The region is facing its worst drought in six decades, and the United Nations has declared a state of famine in five regions of Somalia with warnings that the situation is deteriorating and could easily spread. 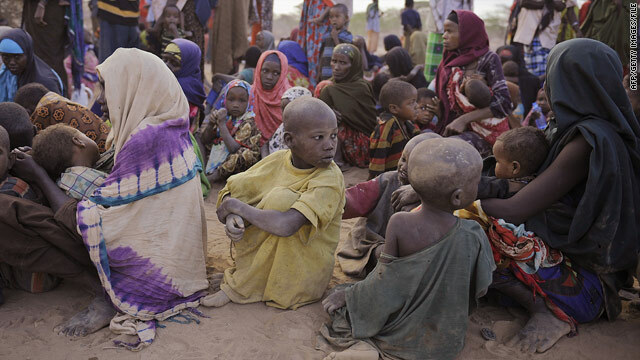 Though food insecurity is also affecting Kenya, Djibouti, Uganda and Ethiopia, the greatest concerns emanate from war-torn Somalia, which has known no central government since 1991. The United Nations is working to round up $2.5 billion to address the situation, which the organization says could be ongoing for six months or more. Biden's trip to Dadaab aims to draw attention to the plight of the Horn of Africa and highlight the Feed the Future program, a U.S. government effort aimed at "helping countries transform their own agricultural sectors to grow enough food sustainably to feed their people." She also will visit Nairobi's Kenya Agricultural Research Institute and meet with President Mwai Kibaki, Prime Minister Raila Odinga and Agriculture Minister Sally Kosgei. The world will be watching Wall Street today to see how it reacts to Standard and Poor's decision to downgrade the U.S. credit rating. Watch CNN.com Live for continuing coverage on this developing story. 9:30 am ET - Wall Street reacts to credit downgrade - For the first time since S&P lowered the U.S. credit rating to AA+, Wall Street will be open for business. Waves from Tropical Storm Muifa cover the coastline in China's Shandong province on Monday. 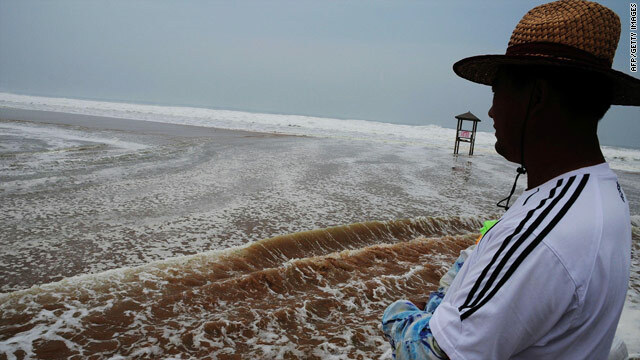 Waves threaten plant: Workers in China were repairing a dike damaged by huge waves from Tropical Storm Muifa in an effort to protect a petrochemical plant, the Xinhua News Agency reported. Waves as high as 65 feet (20 meters) broke through the dike in Dailan, Xinhua reported, citing military personnel working on the repair. Officials fear a toxic spill could occur if sea water reaches the plant. The Fujia chemical plant produces paraxylene, a carcinogenic chemical used in making polyester film and fabrics, Xinhua reported. Dangerous heat: Most of Oklahoma and parts of Kansas, Texas, Arkansas, Tennessee and Mississippi are under excessive heat warnings Monday as the heat indices in those areas could reach 110 degrees. The National Weather Service warned against most outdoor activities, saying life-threatening situations could develop, especially if proper hydration isn't practiced. Some areas may get limited relief from thunderstorms, forecasters said, but they also warned the dangerous heat may not break until midweek for other areas. LeBron's bikeathon: Miami Heat star LeBron James is headed back to his hometown of Akron, Ohio, on Monday, this time to lead a 2.6-mile bike ride through the city’s streets as part of his “Wheels for Education” initiative. James and 20 high school students will pedal from the University of Akron to East High School where hundreds of students in the program will await them. The bike ride will be the first event since the program underwent a name change from the King for Kids Bike-A-Thon. The initiative strives to improve the academic success of third-graders from single-parent households.